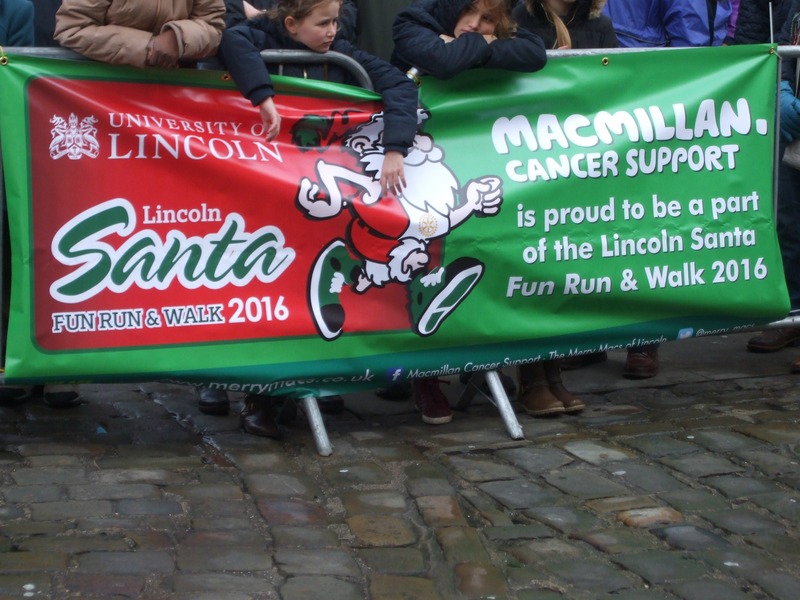 Today, Sunday December 11, we decided to head into Lincoln to watch the annual University of Lincoln Santa Fun Run, organised by the The Rotary Club of Lincoln Colonia in aid of a number of local charities. The university itself sponsors Macmillan Cancer Support. 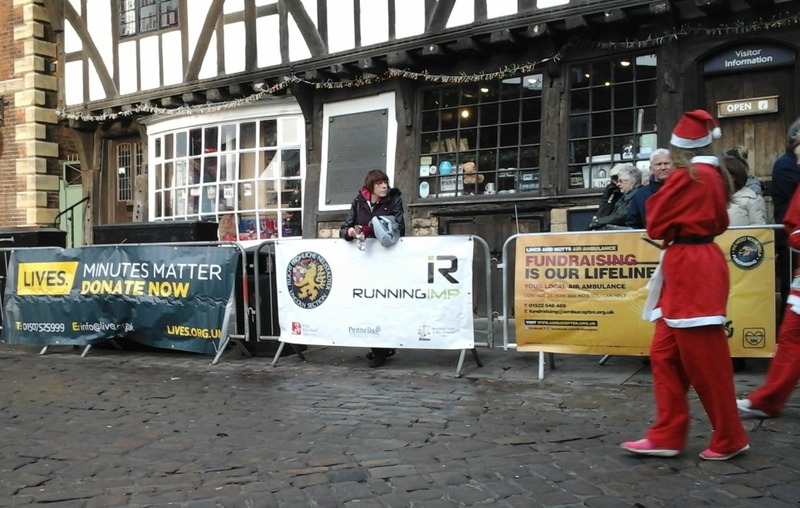 This was the eleventh time the Lincoln Fun Run has taken place, and just like the brilliant Christmas market held annually over the first weekend of December, each year has seen the event growing in size and popularity. This year, well over 2,500 santas took part – as well as over 200 canine ones. We’ve been a couple of times in the past but had never bothered to take photographs before. So today we went with determination! The run was scheduled to start at 11.30 am, but we got there well before 10 o’ clock, purely to make sure we found somewhere to park – and to find ourselves a ‘viewing spot’ near the front in order to take the photos. Last time we went, we were a long way back in the crowds and all I managed to see was the odd flash of red now and then. 😦 So we mooched about and took a few pics here and there of the organisers making the final preparations to the route, as well as the gathering santas and supporters. The ‘compere’ kept supporters entertained as we massed, and at one stage he asked whether any of us were visitors from distant places. It was interesting to note that amongst those were people from Australia, New York and California. The photos below show one on the inflatable santas going up. The run eventually started behind this cheery chappie, at the other side of the castle. Here are just a few photos of ‘The Gathering of the Santas’ – as we decided to call it. The santas in the blue suits were running in support of Nepal. The ‘Run’ itself was a lot of fun and spectators added to that with their support of the participants. Some of the faster runners completed the 3.5 km (2 mile) run very quickly, but everyone was well encouraged and cheered on. The route involved two laps, part of which circled the imposing cathedral. Yes – perhaps I ought to get some training in before next year and have a go myself. 🙂 I can always do what we used to call ‘scout’s pace’, which involves running thirty or forty paces and walking that distance, alternately. Thanks Peggy. Santa run looks interesting. Is Lincoln an old town? with lots of interesting buildings? Wow! that’s quite some history. I wonder how many places have history dating back to 1000 years? That’s incredible! I’m sure the entire setting of the town must be awesome! would love to have at look at more pictures from this city. Have you posted something from this town earlier? Thanks, Arv. Lincoln dates back over 2000 years (Roman times). I have photos of Roman remains in the city and have been meaning to write a post about Lincoln though history for ages. Unfortunately, this year hasn’t been a good year for me for blogging – but hopefully, next year will be better! Looks like lots of fun. Good to help inning funds for cancer. I have been neglecting all my blogger friends the last few months. I hope to catch up during the holidays. Schools close on Thursday(15th) We start again in the 31 January. Oh, my first grandchild is due 21/22 Dec. I am very excited can hardly wait to see the little girl. Enjoy your evening/day. I definitely agree about support for cancer trusts, Ineke. So many people fall victim to that awful illness/ disease. There were two cancer charities being supported on Sunday, Macmillan Cancer Support and Candles. I believe two ladies, who had both survived cancer, were instrumental in setting up Candles, in 2001. All the other charities were very worthy ones, too. As for blogging … this has been a very poor year for me on my blog. I’ve had many weeks when I haven’t managed a single post. I have too many reasons to go into here, and I wish I could say it was because I’ve been devoting all my time to my writing. But it’s more than that. We’ve had a lot of family issues to deal with, which have involved us being away from home a lot, in addition to having holidays as well. Just one of those years, I suppose. It seems you’ve had a similar one and been really busy. Perhaps things will be better for us both in 2017! Wonderful news about your expected grandchild – and so close to Christmas! Let’s hope the little girl doesn’t keep you all waiting until after the holiday! Time flies. Can’t believe it’s the last 2 weeks of 2016. I hope the little girl will come soon. Everything is in place now after a long cleanup and clean out. My son had to move his business into the garage so that the room will be ready for the baby. I’m house sitting for two weeks and hope to catch up with my writing and reading. I still have to put my written pieces from 2015 on my PC. Lot of writing from 2016 is also still on paper. That half-inflated Santa looks like he’s doing the limbo. Your lovely pre-Christmas activities are of my particular interest. Thank you for sharing! Happy week, dear Millie! what fun!! and for a good cause. Those santa’s need some figgy pudding!! I think they deserve it after their efforts on the day. Most were very fit-looking people, although there were plenty of walkers, too. I felt guilty in not participating. (I might have done if the incentive had been figgy pudding!) 😀 Thank you, Cybele. Thanks, Freya. It was a lovely, festive day and everyone had a lot of fun. It was doubly good because it raised a lot of money for worthy charities. Must be an interesting event Millie… so colourful and fun! It’s definitely a fun day, Shivangi, and draws a lot of people. Lincoln has a lot going on throughout December, including the yearly Christmas market and a big ice rink for the children. The city always looks very festive. Wonderful post. I myself am a long-time melanoma survivor, and lost my sister to breast cancer metastisized to bone. Both of us have always adored Santa and Christmas, so something like this run is a bittersweet read. Hi Madelyn. I’ve just been over to your site to find that it’s pretty amazing. You have so much useful advice and information, I’ll need a little time to actually navigate through some of your posts. (I’m looking forward to reading your coming posts about sleep problems – although I think mine have just got worse with age!). I’m sorry to hear you lost your sister to cancer and that you were a cancer sufferer yourself. I can imagine how you felt on reading this post. Caner charities have always been the ones I support the most, even before my mother died of it some years ago. We really do need to plough money into research to make better progress with both detection and treatment. I know great advances have been made in recent years but there’s still a long way to go. It costs £10 to enter the race, which includes the free Santa suit. Runners are requested to collect them before the day, if possible, and come ready ‘dressed’ for the race. The Rotary Club of Lincoln are the main suppliers and they also had a marquee near the castle for last minute ‘collectors’. Suits can also be collected from various sports and health shops in the city. It’s all very well organised – and like you, I’d like to further investigate the back stories of people involved in the event. So often such people have been sufferers themselves. Thank you for taking the time to read my post. You sound like a very busy lady! Thanks for answering one of my questions about how race logistics work — I’m not a runner, but if I were there I might enter just to get to wear that cute suit. Next year you need to interview a few of the runners – inquiring readers want to know. It warms my heart to read about grass roots efforts to solve health challenges – and NOT just cancer. I wish DT and his billionaire buddies would jump on the philanthropic board – that WOULD be a Christmas miracle! Thanks for the endorsing words about my site. Glad to connect with you, mgh! Interviewing runners is a great idea for next year. Thank you! I hope that Christmas miracle actually happens for you – although I wouldn’t hold my breath, if I were you. We have our own wishes (prayers, even!) for miracles re. funding for the NHS over here. If only…? Re: interview – how much before the race do people start signing up? The event organizers might be thrilled to connect you with a few to interview for blog posts as a way to help publicize the run. I have quite a few Christmas miracle wishes – some for me, but many for America and the world. I am always grateful, however, when my pup and I are warm, fed, and healthy. So many people don’t have even that much – and I wish that EVERYONE got at least that for Christmas. Millie is my pen name, and in my case it’s short for Millicent. I picked the name Millie Thom as a sort of tribute to my patents. Mum was Millicent -Millie for short – and dad was Thomas – Tom for short. When I came to use the name Millie Tom for email purposes etc. I found there were several other people with that name, so I decided to keep the ‘h’ in the surname. I’ll be sure to have devised some interesting questions to ask before next December. I’m very grateful for your suggestion as It’s not something I’d thought about. My mother’s mother was a Mildred “Millie” – which is why I asked. Millicent is so much prettier. I’ll look forward to reading those interviews — I always love the back stories. As in “Thoroughly Modern Millie” – a throwback to the 20s if there ever was one. What a good cause. But how does the half deflated santa with only legs eat? Where does it go? At least hes out there for a good reason!